Racing Hearts is novella number 12 in the Love Is series by Prism Book Group. The theme of the story is trust. Rick and Jordyn are a young married couple learning to step out on their own, away from their family as Rick embarks on a new job in a new town. Along with all those changes comes news that Jordyn is pregnant. Rick works and takes care of his wife who is finding the pregnancy more difficult than for most. He cooks, cleans, and works full-time wearing himself out. Jordyn struggles to understand why he gets so protective of her. Learning to trust God for everything from their marriage, health, finances, and baby, makes for a story that will warm your heart…and perhaps make it race too. I give the novella five bones because I’m a dog and I don’t do bones. Linda Yezak has finally released the follow-up to Give the Lady a Ride and I couldn’t be more thrilled. Mom was given an advanced copy to read and could not put The Final Ride down. After all, we all love cowboy stories, don’t we? My only complaint is there was no dog on that ranch. What’s up with that? Patricia’s friend Marie is away on her honeymoon. Talon longs to marry Patricia but she’s hesitant because of the betrayal of her previous husband. He’d lied to her. She believes Talon would never do that but if he did, it could be a deal breaker for their relationship. Her aunt arrives to try to tempt her back to New York and life on the ranch gets chaotic. Romance and time alone with her beau become scarce. Talon is faced with a dilemma. He’s a bull-rider but his last ride left him injured and recovery was hard. In the meantime he’s fallen in love with Patricia, the owner of the ranch he works for. Patricia is an “Uptown Girl” who’s finally adapted to ranch life. She loves him but has asked him to promise not to ride a bull again. But if he does ride would he lose Patricia and his livelihood as well? Would he be sacrificing everything? And what if that’s exactly what God is calling him to do? When the season gears up and the desire to ride is great, coupled with the taunting from a fellow rider, Talon sees red and struggles with the challenge to keep his word and ride again so that when he hangs up his bull-riding hat he’s done so at the top of his game. Not afraid like some would say he was. The Final Ride is a sweet romance filled with conflict, fun secondary characters and a realistic struggle to negotiate love and the calling and gifts one is given. Mom couldn’t stop smiling when she had finished the book and said she wants a cowboy of her own. She’ll have to settle for me though since she’s allergic to horses! I’m giving this book five bones even though it didn’t have a dog in it. Mom really liked it a lot. And I don’t do stars–I’m a dog. 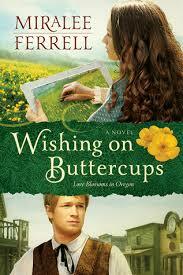 I managed to snag a free copy of Wishing on Buttercups by Miralee Ferrell. This is book 2 in her Love Blossoms in Oregon series and is a great stand-alone romance. Beth Roberts has run away to a small town in Oregon to escape heartache and a painful past. No only does she keep a physically painful secret but she also keeps her profession a secret as well. She doesn’t believe she could trust anyone with the truth of who she really is. Jeffery Tucker has run away as well, from family expectations and demands, in order to pursue his own dreams as a novelist. LIving in the same boarding house as Beth and her aunt, he finds himself drawn to the young woman of faith and mystery. He finds himself intrigued not only with who she is, but also her views of a personal God and a living faith. Memories surface revealing more and more of the pain of Beth’s shadowy past as two men seek her out. Who can she trust? She finds herself drawn to Jeffery and even more so when her illustrations are part of his debut novel appearing in a series in a national magazine. Little does she know that even with a pseudonym she has drawn attention to someone from her past. Can she trust Jeffery with the truth? She’s drawn to the man but in her heart believes that no one would ever be able to love her. As the past merges into the present both Beth and Jeffery have ot confront their deepest pains and struggle to forgive. And maybe, just maybe find love she never thought could be hers. This is a sweet novel. Some of the dialogue seemed stilted but this is 1880’s West and even in the rough and tumble wilderness of Oregon politeness and proprieties would be observed so I’m not even sure that is an entirely just criticism. The story is well written and the characters make you want to care about them and their potential for a future together. Miralee does a good job at keeping Beth’s past as much a mystery to the reader as it is to her until it is fully revealed toward the end of the story. Sweet title and nice cover. This is a charming inspirational romance. I know that often I do reviews of fiction, especially romance, because that’s what I love to read and write. But sometimes I come across a book so good, that I have to share it with others. 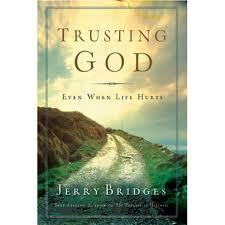 Trusting God by Jerry Bridges is one such book. Originally published in 1988, and re-released in 2008, it has lost none of its value for the time that has elapsed. Bridges asserts that while Scripture explains both concepts of sovereignty as well as freedom and personal responsibility, it never fully explains the relationship between the two. He at length explores these concepts with a light touch and deep understanding with practical application. If you struggle and hurt and life is difficult (and when isn’t it for all of us at times? ), then I recommend this book to you. It is easily read and understood even though a big word like “sovereignty” can put one off, it is an essential characteristic of God for us to understand if we are to walk in faith and confidence into the life He calls us to. This is a book I will be going back to again and again.